The Federal Food and Drug Administration (FDA) Commissioner Scott Gottlieb, MD, released a statement proposing new steps to protect youth from accessing flavored e-cigarette products and banning menthol in cigarettes and cigars. The CDC, in partnership with the Food and Drug Administration (FDA) and the National Institutes of Health’s National Cancer Institute, released a report showing US adult smoking rates have reached a new low. Researchers analyzed data from the 2017 National Health Interview Survey (NHIS). In 2017, an estimated 47.4 million U.S. adults (19.3%) currently used any tobacco product, including cigarettes; cigars, cigarillos, or filtered little cigars; electronic cigarettes; smokeless tobacco; and pipes, water pipes, or hookahs. Among current tobacco product users, 86.7% (41.1 million) smoked combustible tobacco products, and 19.0% (9.0 million) used ≥2 tobacco products. Considerable progress has been made in reducing cigarette smoking among U.S. adults over the past half century: an estimated 14.0% of U.S. adults (34.3 million) were current cigarette smokers in 2017, representing a 67% decline since 1965. Prevention works! The most recent Monitoring of the Future data shows decrease in the percentage of teens who drink. Read more here. The Surgeon General has released a Spotlight on Opioids toolkit to shine a light on the latest data on opioid misuse and overdoses. Centers for Disease Control and Prevention estimates deaths in 2017 increased by almost 10% claiming the lives of more than 70,000 Americans. 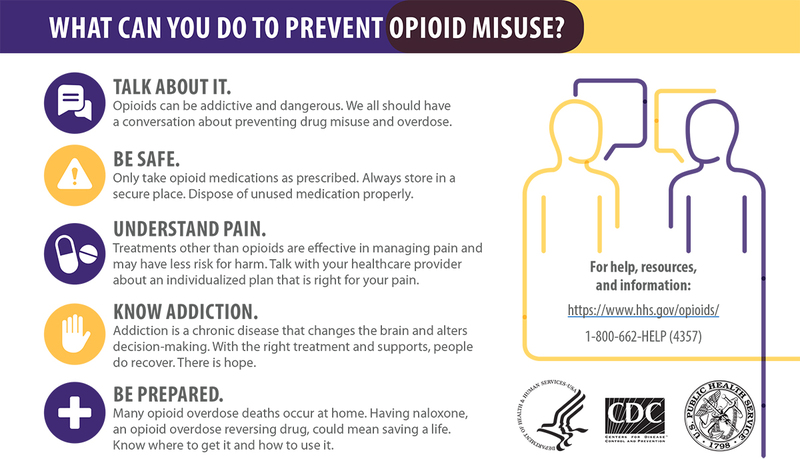 The Surgeon General also released a digital postcard to help individuals understand how they can help prevent addiction or assist a loved one that may be struggle with addiction. Please visit SAMHSA to view a video presentation of the National Survey on Drug Use and Health (NSDUH) data findings by Assistant Secretary for Mental Health and Substance Use, Dr. Elinore F. McCance-Katz, MD, PhD.. The Community Anti-Drug Coalitions of America (CADCA) annouced the launch of an Online Toolkit for addressing substance use and misuse in veteran populations. CADCA selected five coalitions who graduated from the National Coalition Academy to implement substance use prevention projects focused on veterans in their communities. The five coalitions represented different demographics and included: Roane County Anti-Drug Coalition, Inc. from Kingston, Tennessee; Prevention Coalitions for Success (PC4S) from Murfreesboro, Tennessee; Gwinnett Coalition for Health and Human Services from Lawrenceville, Georgia; Troy Drug Free Community Coalition from Troy, New York; and Carter County Drug Free Coalition from Ashland, Kentucky. The online toolkit is based on the experiences and findings of the five participating coalitions.